The words pleasant and colonoscopy aren’t usually uttered in the same breath, but one 67-year-old woman who underwent the procedure at The Lennar Foundation Medical Center said she couldn’t help but describe her experience that way. Chris Loulan (in pink), director of perioperative services, says members of Lennar’s staff were selected as much for their attitudes and communication skills as for their experience and expertise. She was hardly alone. 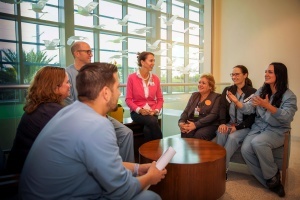 Hundreds of patients who answered a survey that recently earned the outpatient surgery center a prestigious Guardian of Excellence Award for Patient Experience during its first year of eligibility used superlatives rarely associated with hospital visits. Among them: Awesome. Superb. Magnificent. Perfect. Out of this world. Setting a new standard for personalized care is Lennar’s goal, and the award, which Press Ganey bestows on health care organizations that reach the 95th percentile for patient experience in every quarter of a one-year period, is solid evidence that the new center on the University of Miami’s Coral Gables campus is meeting it. From its soothing spa-like ambiance to its infection-resistant stainless steel operating suites, every detail of the five-story, 200,000-square-foot center was meticulously designed to provide a comfortable and comforting environment not only for patients and their families but for the doctors, nurses and other staff who get the credit for Lennar’s high Press Ganey marks. Communication and teamwork are key to Lennar’s culture, and both begin before any of the nearly 700 patients who undergo elective surgeries or interventional radiology or other minimally invasive procedures every month even walk into the light- and music-filled lobby. In advance of every procedure, a pre-admission nurse in Lennar’s University Perioperative Assessment Center (UPAC) calls or personally sees every patient to make double sure the patient understands all the pre-operative restrictions or directions. That means open lines of communication with the chief of surgery, David Arnold, M.D., and the chief of anesthesiology, Todd Smaka, M.D., to ensure every patient is appropriate for outpatient surgery and that any special instruments or essential supplies are on hand and ready to go. On surgery day, members of nurse Shelby Head’s team of 17 pre-operative and recovery nurses do their best to be the calm and soothing presence that puts anxious patients, and their loved ones, at ease. Whenever possible, they like to be the familiar face that follows each patient through recovery and discharge. But when that’s not possible, nurses are cross-trained to ensure that anyone can fill in almost anywhere, which, as Lee Weirich, nurse manager for UPAC, pre-op, and recovery, notes, has advantages not only for patients but for the staff. Unlike other places she’s worked, nurses may postpone lunch, but they won’t go without. That and a serene, sun-drenched workplace — and breakroom — are among the perks at Lennar. The teamwork didn’t go unnoticed by patients who completed their Press Ganey surveys for the more than 8,000 procedures performed at Lennar between May 2017 and April 2018, the time period for its Guardian of Excellence Award. The survey consists mostly of yes and no answers or 1 through 10 rankings about the quality of the care. But many patients feel compelled to add notes thanking every member of their Lennar team. One 61-year-old man singled out the receptionist, admitting nurse, anesthesiologist, gastroenterologist, CRNA, “and all the pre and post procedure staff for making the process so smooth, respectful, compassionate, and efficient. Credit for that culture, Loulan said, belongs to Riestra, whose charismatic and empowering leadership has enabled teamwork and communication to be as much a part of Lennar’s building blocks as the piano music, floor-to-ceiling windows, and concierge-like services that, as some patients noted, imbue the medical center with the feel of a 5-star hotel. “There are four words you’ll never hear from this team: It’s not my job,” Loulan said, before spotting a paper coffee cup left behind in the reception area. She pauses to pick it up and throw it away.